The City of Lakes, Udaipur in Rajasthan is called the Venice of the East. The magnificent palaces, crystal clear lakes and exquisitely crafted temples reflect the medieval aura of Rajasthan. Explore the beauty of architectural splendor as well as the crystal blue lakes in Udaipur. Indiahotelandresort.com offers online booking and information in Hotels in Udaipur. Hotels in Udaipur offer to the guests the best of services and amenities to make their vacation a memorable experience. From the budget hotels of Udaipur for all the economy travelers to the comfort crazy tourists, Udaipur has something for all of us. 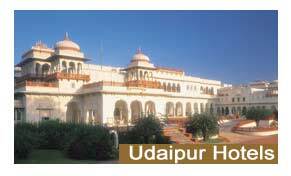 Relax in the hotels of Udaipur and experience the excellent hospitality, well furnished d�cor of the Hotels of Udaipur. Nearest Airport :- Debock Airport connects the city with other major cities of the country. Nearest Railhead :- Udaipur Railway Station is connected with the major states in the country. Lake Palace :- Lake Palace is one of the famous tourist attractions of Udaipur. A beautiful marble palace situated on the green waters of Lake Pichola, this reminds the tourists of royal glory and grandeur as well as Rajput romanticism. City Palace :- Located on the banks of Lake Pichola, the City Palace is another example of Rajput glory. A huge palace complex it reflects traces of exquisite European as well as Oriental architecture. Pichola Lake :- One of the picturesque lakes of Rajasthan, the Pichola Lake is a major tourist attraction of Udaipur. Enjoy a boat ride on the beautiful waters of Pichola Lake during the sunset and experience the beauty of Rajasthan. Indiahotelandresort.com.com offers online booking in Hotels in Udaipur and other hotels in India.